Pet tortoises are popular pets for many people since they are quiet, cute (especially as hatchlings), and don't shed any fur. But tortoises can live a very long time (anywhere from 50 to 100 years). If you take one as a pet, be prepared to provide a lifetime of care and consider that your pet might even outlive you if you choose to keep one as a pet. Most tortoises are docile and tend to be shy, unless two males are put into an enclosure with each other. This is not advisable; two male tortoises could become aggressive toward each other and even attack each other, sometimes resulting in serious injury. Most tortoises are too large to handle as adults, and it's advisable not to handle them to any great degree when they are smaller, either. This can cause the tortoise stress, which often leads to illness if the stressful situation is ongoing. The biggest drawback to a pet tortoise for most people is their long lifespan. Larger tortoises like the sulcata can live more than 70 years, so you'll need to have a plan for caring for a pet tortoise in their (and your) old age. Many tortoise species are fairly large and need a decent sized enclosure, preferably outdoors. Because of these preferable housing arrangements, pet tortoises are best suited for areas with milder climates. Depending on the temperatures where the tortoise originates and the area where you live, it may be necessary to bring pet tortoises indoors overnight or during cooler weather, and with the larger tortoises providing indoor housing can be a big challenge. Some species also need to hibernate which can be very stressful on the tortoise and requires special environmental conditions. When constructing an outdoor pen, you must make sure it is strong and that you bury your fences if you have a burrowing pet tortoise. Tortoises are quite strong, especially the larger ones, and flimsy enclosures won't hold them for very long. Some tortoises also climb surprisingly well so they may require a roofed pen. It is also very important to make sure the enclosure keeps predators out (including dogs). Make sure there are no dangers in the pen, including poisonous plants. Provide only shallow water, no sharp objects, and no small, inedible objects which may be accidentally ingested. Also for some tortoises, trying to climb steps or other obstacles can result in them tipping onto their backs which is something that should be avoided. Most pet tortoises will also need some shelter outdoors such as a dog house (many owners often heat these). Tortoises can make interesting pets although they can present some challenges due to their size and dietary habits. Diets vary based on species, but all pet tortoises need quite a variety of foods with careful attention paid to the amount of roughage as well as the calcium/phosphorus balances of their food. Some species have voracious appetites and also need a large amount of food. Time for daily food preparation and the costs associated with the amount of food a tortoise eats should be taken into consideration before getting one as a pet. It is best, as with any reptile, to get a captive bred pet tortoise if at all possible. This isn't easy to do for some species, but the capture and shipping conditions can be appalling and result in stressed animals which are then more prone to disease. It is also possible in some areas to locate pet tortoises from rescues; many of these are from owners who decided they couldn't handle the amount of upkeep and care a tortoise requires. Any pet tortoise that is new to your household should be checked for parasites and quarantined for a while to ensure that it is healthy, especially if other tortoises are present. Some species can be aggressive with other tortoises and if a couple of males are kept in too small of an enclosure fighting may result. This could lead to potentially serious injuries around the eyes and on the legs. It is vital to choose the right species of pet tortoise for you based on housing needs, environmental needs, and diet requirements. Different species have markedly different adult sizes, temperature and light needs, diets, and some need to hibernate while others do not. Be sure to research each individual species of tortoise you are considering prior to acquiring your new pet. Common pet tortoises include Russian, red-footed (and cherry head varieties), sulcata, Greek and radiated tortoises but there are also many others. Like most reptiles, tortoises are prone to respiratory infections. Pet tortoises that were raised in the wild are more likely to suffer from respiratory infections, which result from unsanitary conditions. A tortoise will appear lethargic, lose weight, and may show excess mucus around its mouth and nasal passages. 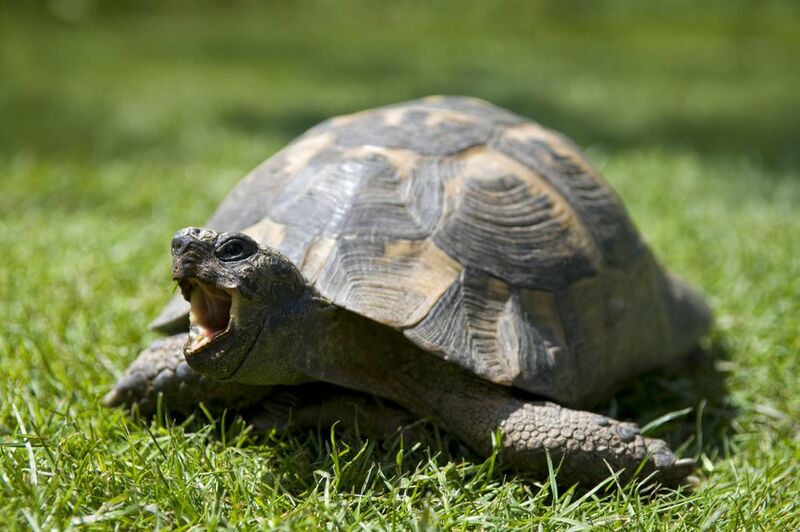 Early signs of a respiratory infection include wheezing and a tortoise refusing food. Tortoises also are susceptible to metabolic bone disease (MBD), which is the result of a diet that doesn't have enough calcium. Like many reptiles, tortoises need to be exposed to ultraviolet radiation A and B (UVA/B) to be able to absorb calcium. Tortoises in the wild typically bask in the sun for most of their waking hours to get this level of UVA/B exposure. If a tortoise doesn't get enough calcium, its shell will show the signs first. If it's a young tortoise, the shell may not grow at a rapid enough rate. Older tortoises may develop weak bones in their legs, and have difficulty walking, or even suffer bone fractures. MBD is treatable, but the longer it persists, the less chance of recovery the tortoise has. Consult a qualified veterinarian, who will likely advise a calcium-heavy diet and more exposure to sunlight or UVA/B rays. You also can check out our profiles of other breeds of tortoises to find the right pet for you. Do Leopard Tortoises Make Good Pets? Can Your Turtle or Tortoise Catch a Cold?